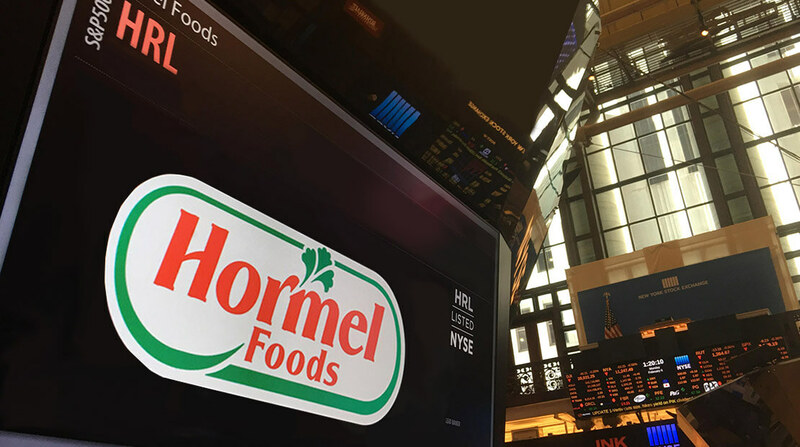 Hormel Foods Corporation (NYSE: HRL), a leading global branded food company, today reported results for the first quarter of fiscal 2018. All earnings per share estimates assume a fiscal 2018 full year tax rate of 17.5 – 20.5 percent. “We are pleased to report a strong quarter of earnings growth. In addition to the benefit from tax reform, Grocery Products delivered excellent earnings growth which was partially offset by continued challenges at Jennie-O Turkey Store and higher-than-expected freight costs,” said Jim Snee, chairman of the board, president, and chief executive officer. “This quarter we also completed the strategic acquisition of Columbus Craft Meats. The Columbus® brand is on-trend with today’s consumer and meaningfully changes our presence in the deli while helping us become a broader food company. Tax reform had a positive impact on our business, and the additional funds will allow us to invest in profitable growth, invest in our employees and communities, and return cash back to shareholders,” Snee said. The passage of The Tax Cuts and Jobs Act in December 2017 lowered the Company’s long-term effective tax rate. In the first quarter, the Company recorded a one-time non-cash tax benefit of $68 million related to revaluing deferred tax liabilities and a $5 million charge related to mandatory repatriation tax. The one-time tax events and reduction in the federal statutory tax rate were the main drivers of the Company’s first quarter effective tax rate of 0.6 percent versus 33.7 percent last year. For fiscal 2018, the Company expects an effective tax rate of between 17.5 to 20.5 percent compared to original guidance of 32.3 to 33.3 percent. The change is due primarily to the decrease in the statutory tax rate, one-time discrete tax events, and the adoption of new accounting standards related to stock compensation. The full year cash flow benefit is expected to be between $100 – $140 million. For Fiscal 2019 and beyond, the Company expects an effective tax rate of between 21.5 to 24.5 percent. Beginning this quarter, the Specialty Foods segment was merged with, and is reported in, the Grocery Products segment. Strong sales growth from Wholly Guacamole® dips, Muscle Milk® protein products, Hormel® Compleats® microwave meals, Herdez® salsas, and the SPAM® family of products more than offset declines from our contract manufacturing business. CytoSport posted volume and sales gains with Muscle Milk® and Evolve® protein products delivering strong double-digit sales increases. Segment profit increased due to strong earnings growth from the Wholly Guacamole® and Herdez® brands and a one-time tax gain in our MegaMex joint venture; lower selling, general and administrative expenses; and improved earnings from our Justin’s® and Skippy®nut butter brands. Sales increases were related to the inclusion of Columbus and Fontanini but were partially offset by the divestiture of the Farmer John business. Foodservice sales of Hormel® Bacon 1™ fully cooked bacon and Hormel® pizza toppings and retail sales of Hormel® Black Label® bacon and Applegate® natural and organic products contributed to the organic sales growth. Segment profit declined due to one-time transaction costs of two cents EPS for the Columbus acquisition, the divestiture of the Farmer John business representing one cent EPS, and increased freight expenses. Harvest volumes decreased by 17 percent due to the divestiture of Farmer John and harvest reductions in our Midwest production facilities. Hog markets were higher than last year but in line with expectations. Volume and sales declines were due primarily to lower harvest volumes and lower turkey commodity prices as a result of continued oversupply of turkeys in the industry and excess meat in cold storage. Sales declines of whole birds were partially offset by increased retail sales, led by Jennie-O® lean ground turkey and Jennie-O® Oven Ready® products. Segment profit decreased as a result of lower profits from whole bird and commodity sales, and increased freight expenses. Lower selling, general, and administrative expenses offset a portion of the earnings decline. Feed costs were flat to last year and in line with expectations. Commodity turkey breast markets remain at multi-year lows, and inventories continue to be elevated. Commodity markets for whole birds were significantly below last year and below our expectations. International sales increased due to the addition of sales by the Ceratti business in Brazil, increased export sales, and strong results in China. Earnings decreased as higher costs of goods for exports were partially offset by the inclusion of the Ceratti business and improving profitability in China due to lower raw material costs. The Company will webcast a presentation of first quarter earnings at the Consumer Analyst Group of New York conference on February 22, 2018, in lieu of an earnings conference call. As such, incremental commentary relating to the financial statements is provided. Advertising expenses were $40 million compared to $52 million. The decrease is related to timing. Full year advertising expenses are expected to increase by more than 20 percent. Selling, general and administrative expenses increased due to transaction costs of two cents EPS related to the Columbus Craft Meats acquisition. Operating margin was 13.2% compared to 15.6%. Higher hog costs, one-time transaction expenses related to the Columbus acquisition, and increased freight expenses were the primary contributors to the operating margin decline. Working capital decreased to $625 million, primarily related to an increase in short-term debt and lower accounts receivable. Capital expenditures were $54 million compared to $38 million last year. Full year capital expenditures are expected to total $425 million. Key projects include bacon capacity increases in our Wichita, Kans., facility, a new whole bird facility in Melrose, Minn., modernization of the Austin, Minn., plant, and projects designed to increase value-added capacity. Depreciation and amortization expense was $39 million compared to $31 million last year. Full year expenses are expected to be approximately $145 million. Share repurchases totaled $25 million, representing 0.7 million shares purchased. The Company paid its 358th consecutive quarterly dividend at the annual rate of $0.75 per share, a 10 percent increase over the prior year. Cash on hand decreased to $386 million as a result of the Columbus Craft Meats acquisition. Total debt increased to approximately $880 million as a result of the Columbus Craft Meats acquisition. The debt is split between short-term borrowings of $255 million and long-term borrowings of $625 million. The Company remains in a strong financial position to fund any other capital needs. The Company’s presentation of its first quarter earnings at the Consumer Analyst Group of New York conference will be webcast live at 5:00 p.m. ET on Thursday, February 22, 2018. Access is available at www.hormelfoods.com. The webcast replay will be available at 6:00 a.m. CT, Friday, February 23, 2018, and will remain on our website for one year. Organic net sales and organic volume are defined as net sales and volume excluding the impact of acquisitions and divestitures. Organic net sales and organic volume exclude the impacts of the acquisition of Columbus Craft Meats (November 2017), the acquisition of Fontanini Italian Meats and Sausages (August 2017), and the divestiture of Farmer John (January 2017) in Refrigerated Foods and the acquisition of Ceratti (August 2017) in International. The tables below show the calculations to reconcile from the non-GAAP adjusted measures to the GAAP measures in the first quarter of fiscal 2018 and fiscal 2017.